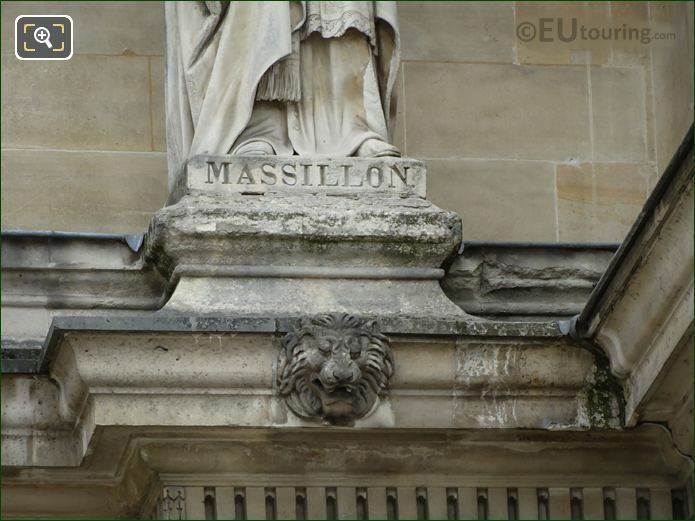 In these high definition photos you can see the statue of Massillon, which we took from the Cour Napoleon while admiring the facade of the Aile Henri IV wing of the Musee du Louvre in the 1st Arrondissement of Paris. This first HD photo shows the statue of Jean-Baptiste Massillon by the artist Francois Jouffrey, and this is located to the very far right hand side of the Aile Henri IV on the first level balustrade next to the Pavillon Sully, which was originally known as the Pavillon de l'Horloge of the Palais du Louvre. So in this next image you can see some of the details such as the cross depicting Massillon, which was produced by Francois Jouffroy, who was born in Dijon in February 1806 and became a French sculptor, receiving numerous commissions for public buildings during the Second Empire including several statues and caryatides for The Louvre, prior to passing away in 1882. 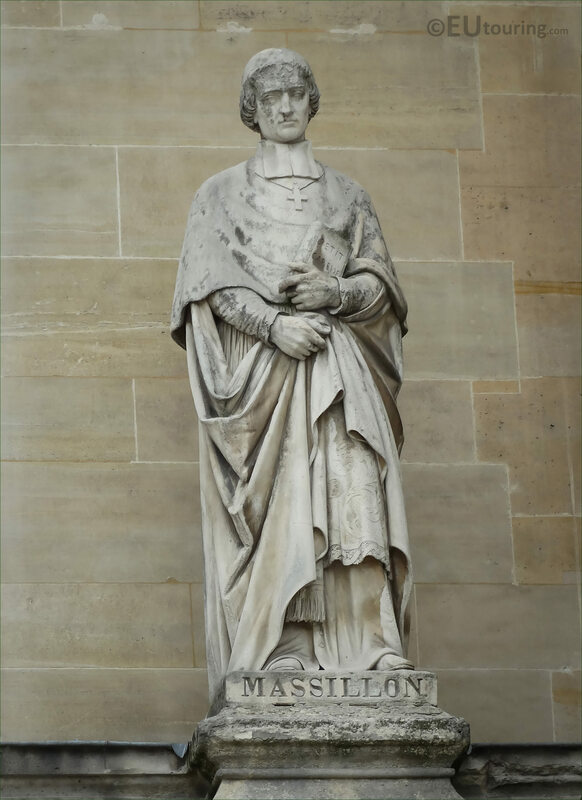 And this last photograph shows the inscription on the base of the stone statue that is dedicated to Jean-Baptiste Massillon, who was born in June 1663 and became a French Catholic bishop and a famous highly regarded preacher. 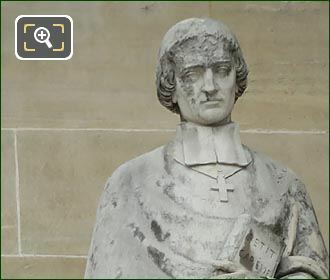 In fact, after delivering an impressive funeral oration for an archbishop, he then settled in Paris and became the head of the Saint Magloire Oratorian Seminary and with a high reputation he was then selected as Advent preacher at the court of Versailles in 1699. 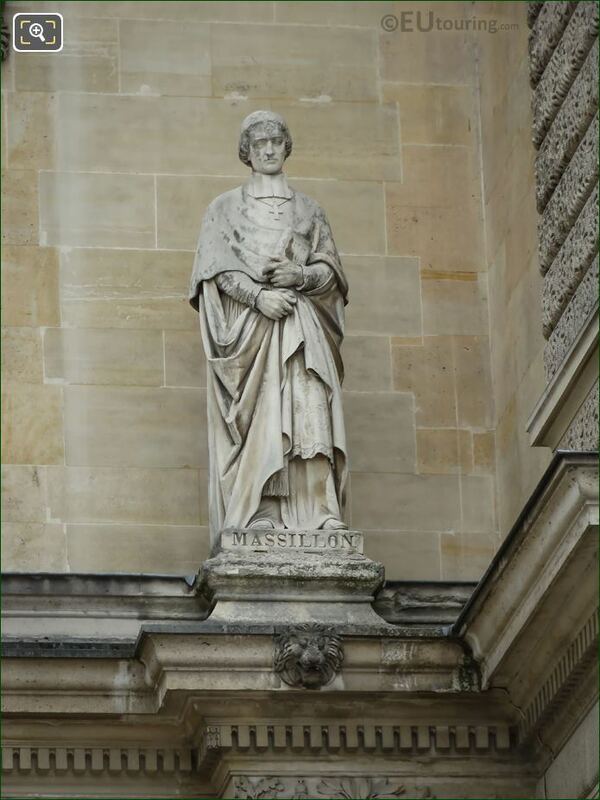 A few years later Massillon was made Bishop of Clermont in 1717, and he served in this position until he passed away in September 1742.